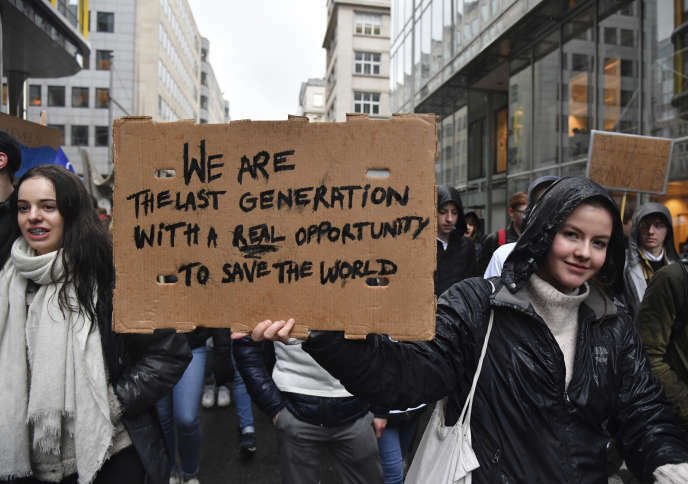 Tens of thousands of students demonstrated in Brussels and called for a "weekly general strike" to protest the weakness of the climate policy in place. Some 13,000 young people marched Thursday, January 17, in the streets of Brussels to demand an ambitious environmental policy to their leaders. Leaving the courses, these students, often very young, responded to the call of the group Youth for Climate, born in Flanders and now spreading to other parts of the kingdom. Parents and teachers support the protesters' initiative, some of whom call for a "weekly wild general strike" that is already raising fears of school principals. "What's the use of going to school if the planet is destroyed and our future is in jeopardy? Asked a young environmental activist interviewed by RTBF. They were already 3,000 last week and the scale of their mobilization on Thursday surprised. The organizers are already promising a new action next Thursday, "even more important," they say . In Antwerp, the first Flemish city, two hundred young people gathered Thursday afternoon. The action started at the initiative of Anuna De Wever and Kyra Gantois, two Flemish teenagers who call to skip school once a week. The movement extends a March for the climate that had gathered nearly 70 000 people in the Belgian capital in December. Protesters blamed the government for its lack of ambition in Katowice at COP 24 and its "climate denialism" . On the contrary, they ask him for an "ambitious plan" that can contribute to limiting global warming to less than 1.5 degrees. Article reserved for our subscribers Read also "Against global warming, humanity must lead a real war"
Two days after the December climate demonstration, the country, along with the Czech Republic, voted against a proposal for a European directive on energy efficiency and abstained in the vote on a directive on renewable energies. Belgium refused to follow the majority of EU member states, which had approved two of the three pillars of the "clean energy package", which was supposed to put Europe in line with the objectives of the Paris agreement. Forced to find a consensus among its three regions, the federal government had, in fact, run up against the refusal, by Flanders, led by the conservative nationalists of the neo-Flemish Alliance (N-VA), of a climate change project. large scale. "Flanders systematically slows down ambitions," lamented federal energy and climate minister Marie-Christine Marghem, provoking a controversy with her counterpart from the Flemish regional government. The opposition ecologist, in particular, believes that in reality the federal government has also failed in the definition of a real climate policy.